The disastrous effects of a tropical cyclone on Mozambique has shown the crucial importance of rich countries providing financial support to poor countries, to help them become more resilient to extreme weather and to adapt to climate change. 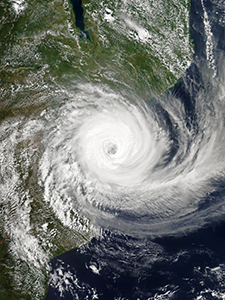 The tropical cyclone made landfall on 14 March near the port city of Beira on the Mozambique coast, subjecting it to a storm surge, hurricane-force winds and torrential rain. Hundreds of people are reported to have been killed, with the death toll expected to rise significantly over the next few days and weeks. Neighbouring Malawi and Zimbabwe have also been hit hard by the deadly storm. Beira has a population of more than 500,000 and is Mozambique’s fourth largest city. It has experienced rapid growth over the past few years, with many people moving into unplanned settlements. Built on a river delta, the city is low-lying and subject to subsidence as the underlying sediments compact. Given its obvious vulnerability it is perhaps not surprising that the city has flooded many times before, including during Cyclone Eline and devastating rains in 2000. Some reports suggest that 90 per cent of the city has been destroyed by Cyclone Idai. Many areas of the city and other parts of the country, particularly along the Pungwe River, are under water. The Pacific Disaster Centre has estimated that more than 180,000 people have been exposed to the flooding in Mozambique. Wind speeds of more than 100 miles per hour were recorded when the cyclone reached land, equivalent to the strength of a Category 2 hurricane. Much of the damage appears to have been caused by the storm surge and heavy rainfall as the storm moved slowly inland. Is there a link between climate change and the magnitude of Cyclone Idai? As yet the extent to which climate change had an effect on Cyclone Idai is not clear. Tropical cyclones need sea surface temperatures of at least 26.5°C, but a number of other factors, such as wind shear, also determine their formation and development. The south-western part of the Indian Ocean experiences 11 or 12 tropical cyclones each year on average. One 2013 study reported an increased occurrence of severe storm days (Category 3 or higher) from the 1990s in that area, although the average total number of tropical cyclones each year has fallen. Another analysis published in 2014 found no trend in the number of tropical cyclones hitting Mozambique since 1960, even though there was an increase of 0.3°C in mean sea surface temperatures over the south‐west Indian Ocean over that period. But it did conclude that recent tropical cyclones have been following more southerly tracks before striking the country, perhaps as a result of rising sea temperatures. Recent modelling indicates that the overall frequency of tropical cyclones in the south-west Indian Ocean will decline due to global warming. However, storm surges caused by tropical cyclones across the world are growing in height due to global sea level rise. The warmer atmosphere can also hold more water, increasing the amount of potential, rainfall during tropical storms. Mozambique has been receiving significant sums of overseas aid from rich countries, including schemes to increase its resilience against extreme weather events, taking into account the impacts of climate change. The Mozambique Cities and Climate Change Project funded by the World Bank had allowed improvements to Beira’s drainage system, leading to a 70 per cent reduction in the risk of flooding, according to one estimate. A new flood barrier had also been built to protect the centre of the city from potential overflow from the Chiveve River. The UK Met Office is participating in a new project to help the Mozambique National Institute of Meteorology (INAM) to modernise its systems, and develop an early-warning system for extreme weather events. While these new initiatives may have helped to mitigate the scale of the impacts of Cyclone Idai, it is clear that this has still been a significant natural disaster. And with climate change potentially leading to more damaging tropical cyclones, even if their overall frequency might decrease, exposed and vulnerable countries like Mozambique need substantial technical and financial assistance from rich countries, including the UK, to increase their resilience and protect lives and livelihoods. Bob Ward is policy and communications director at the Grantham Research Institute on Climate Change and the Environment and the ESRC Centre for Climate change Economics and Policy at the London School of Economics and Political Science.